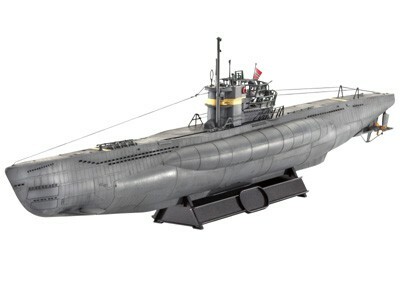 German Submarine TYPE VII C/41 "Atlantic Version"
Starting mid-1943, 91 u-boots Type VII C/41 have been launched. By then, the conditions of the battle had totally changed. The "wolfpack tactic" achieved then seldom positive results against better protected convoys, especially with the introduction of air umbrellas. With the aim of a better defence when surfaced, the Type VII C/41 u-boots were fitted with a modified, larger bridge called "large wintergarten (winter garden)" armed with two 20 mm flakzwillings and one automatic 37 mm M42U flakkanone, which are reproduced with precision in the kit. A swivelling snorkel mast (also swivelling in the kit) for fresh air and fume exhaust, and four pressure boxes with 5-man floats were additional typical of these boats. The use of better steel sheets allowed the maximum depth to reach 250 metres. New parts are included, for the wooden deck planking with engraved pressure boxes and the "Atlantic" type bow. The beautifully detailed hull shows rivets and welding seams. Following u-boots can be reproduced with the decal sheet: U 292, U 318, U 998 and U 1004. - Deck version with "large winter garden"